The Fed Is Best Foundation is a non-profit, volunteer organization of doctors, nurses, lactation consultants and parent patient advocates who study the scientific literature on infant feeding and real-life infant feeding experiences of mothers through clinical practice and social media connections. We work to identify dangerous gaps in current breastfeeding protocols, guidelines, and education programs, and provide families and health professionals the most up-to-date scientific research, education and resources to practice safe infant feeding with breast milk, formula, or a combination of both. We provide safe, brain-protective infant feeding education and direct one-on-one support for breastfeeding, mixed-feeding, formula-feeding, pumped-milk-feeding and tube-feeding mothers and families to prevent feeding complications to babies. Your contribution of any size is greatly appreciated and will help us meet our goals and work to ensure that all babies are fed and nourished with safe, evidence-based practices. We are a U.S. tax-exempt 501(c)3 non-profit organization and any donations made to the Foundation are eligible for tax-exemption on your tax filing. A special bonus for this fundraiser is that gifts of $10 or more get a special thank you! 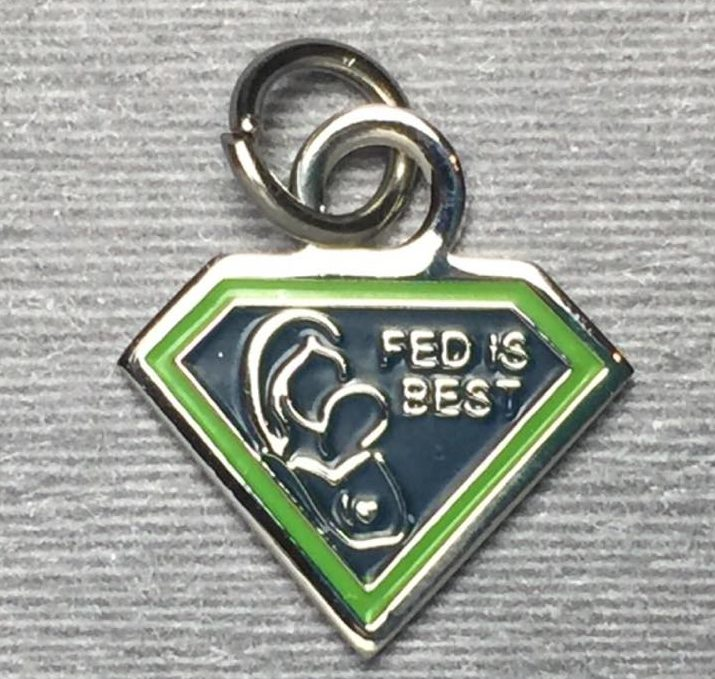 #FedIsBest Advocates donating $10 and up will receive a #FedIsBest charm or 2-inch button. Healthcare professionals have requested the Fed is Best button to show their support of the Fed is Best Foundation while discussing safe feeding options with their patients. For donations of $5 or more, we can send you a Fed is Best decal (available in the original logo colors, pink and green and black and white). Please make sure to indicate your preferred gift and a mailing address. Proudly show your support for all parents and feeding methods and help us reach our goal to ensure all babies are fed and nourished safely, in the ways that are best for them and their families. Our work honors all the ways babies are fed and nourished by promoting safe, evidence-based practices, and strives to empower parents and parents-to-be with information on how to safely feed their babies, identify feeding risk factors, work with health care providers, recognize signs of feeding issues and related infant health conditions, and avoid infant re-hospitalizations and negative outcomes. To produce and disseminate our evidence-based infant feeding protocol materials to parents, health professionals and health care facilities. To help fund our operations costs, such as maintaining our website and servers, business fees, social media advertising, printed materials for health providers and health facilities, etc. To advocate for and support parents and families who have experienced infant feeding complications and shaming for how they feed their babies. We are also advocating for national and global change in infant feeding policies to prioritize avoidance for starvation-related complications, particularly in breastfed infants to hospitals, major health organizations, health insurers and elected officials. Fed is Best Foundation is a 501(c)3 non-profit organization with a strict policy of not accepting funds from any company, organization or entity that obtains revenue through infant feeding products and services, including breast- and formula-feeding companies. All resources on FedisBest.org are free because we believe that safe infant feeding is a human right. I hope that your organisation can change the stigma around formula. I starved my first two babies trying to ebf and even though topping-up with formula from the start with my third has made our family much happier, I’m still too ashamed to meet up with other new mums. I want to give this to the Foundation so that it may succeed in saving children and families from life-changing tragedies.